Nowadays, life can get very busy and our speedy lifestyle challenges our inner balance. Stress manifests illnesses and disharmony in ourselves. Negativity and fear take physical toll. Do we allow ourselves to take time for stress relief? Short-term stress is supposed to be good for us but long-term stress may result in negative consequences. We can free ourselves from these thoughts. Letting go of patterns will rebalance and energize our health and happiness. With avoiding things or people dragging us down and surrounding ourselves by positive thinking, our life can brighten up. Stress relief happens automatically. Yoga, meditation and exercise release physical, mental, and spiritual tension. This results in reunification of what has been separated, our mind and body. ॐ (AUM) is the primary mantra, the sound of the universe, with the power to modify our thinking. Mantra chanting resonates with our senses, calms our mind and enables us to use inner energies. In this way our body, mind and soul restore in harmony. We found people who had never meditated before and we scanned them and then we put them through an 8-week meditation program and then we scanned them again. And we were able to show that in just 8 weeks we were able to detect changes in brain structure. In our Vision, YOGOJA Mats emerge as the ideal stress relief and tension-breaking partner bringing relaxing meditation / yoga mats. Designed to lift the spirit and aid motivation with beautiful colour vibrations, our mats create a grounding but stimulating foundation. The healing effect of colour combined with harmonizing impacts of geometrical patterns as mandalas, act centering. Inner peace is created. They contribute to releasing tension and letting go for a free mind-set as a perfect base to build up muscles and soul. According to our vision, people decide consciously to live a healthier life looking after themselves. Humans have a basic need for motion. If it's not the marathon or yogi cup, any regular walks or stretching does definitively delight our system. Healthy food helps the body too and disgusting food can please the mind from time to time. Research has proven the important connection between body and mind. Change your mind and you change your health (The Connection). YOGOJA assists as a kind reminder (Free-Flowing). Sacred Geometry describes certain geometrical objects with a sacred meaning. Ancient cultures show different shapes and geometrical patterns that appear in earth, water and air and fire. This sacred geometry connection was found to exist through the whole universe within the origin of everything. YOGOJA is inspired by the effects of Sacred Geometry. The language of the symbolism provides a centering impact and nurture mindfulness. They promote inner reflection, calmness and relaxed concentration. The patterns of Sacred Geometry are used for meditation purposes. Today, Sacred Geometry is considered as a structure of energy providing access points to deeper awareness. The author, a certified nutritionist, treated her own anxiety successfully. She shows you how natural treatments and dierary changes can make you feel much better. Read how she learned to center her artistic explorations on the intelligence of the heart rather than the intellect, utilizing the wisdom and imagery of Sacred Geometry. Strengthen your natural defense and stay resilient whatever happens! Stress is unavoidable but it can result in (chronic) health issues. 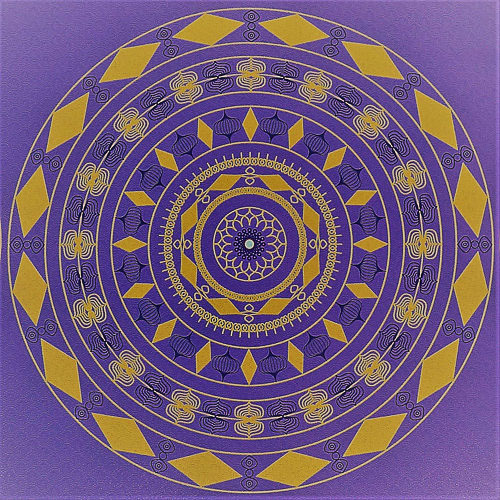 Learn how to create your own mandalas using the ancient tradition of sacred geometry. Drawing & coloring mandalas is considered as a meditative tool.